...Clean CARFAX. 1993 Mitsubishi Mighty Max RWD 2.4L I4 16VRecent Arrival! Seller: Paris Fisher Auto Sales Inc.
1988 Mitsubishi Mighty Max Pickup - Cheap - Trades Considered! 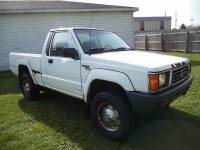 1988 Mitsubishi Mighty Max Pickup Truck - Selling Cheap or Trade!